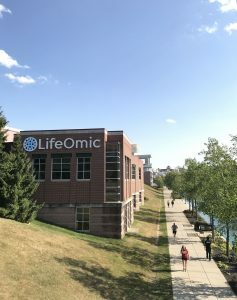 INDIANAPOLIS – Indiana University, the Regenstrief Institute and Indianapolis-based technology company LifeOmic have announced a first-of-its-kind collaboration to advance the development of precision medicine, a personalized approach to disease treatment and prevention. Under terms of the agreement, LifeOmic receives a blanket license to a broad range of intellectual property owned by IU and Regenstrief as well as access to faculty. In return, IU and Regenstrief receive a minority equity position in LifeOmic. The strategic agreement will greatly facilitate collaboration across the three partners, removing traditional barriers between for-profit and not-for-profit organizations. The mapping of the human genome has made it possible to discover the underlying genetic causes of diseases in individuals and to tailor therapy based on that information. But the field of genomics also poses new challenges, as vast volumes of data must be analyzed, stored and incorporated into physicians’ decisions about diagnoses and treatments. LifeOmic will work with scientists at IU and Regenstrief to develop a “data commons” to store genetic and other medical data for millions of patients within a single repository. The result will be a platform that can be used by researchers and clinicians around the state to make discoveries and improve the delivery of personalized health care. The agreement also enables individual investigators at IU and Regenstrief to seamlessly collaborate with LifeOmic on other projects. For example, an IU immunologist might work with LifeOmic to develop a test to help physicians more efficiently and accurately diagnose autoimmune disorders. Such partnerships with industry are common but typically require separate, time-consuming negotiations for each project. Regenstrief President and CEO Peter J. Embi, MD, and LifeOmic founder and CEO Don Brown, MD, also praised the potential benefits for patients and the state of Indiana. IU School of Medicine is the largest medical school in the United States and offers high-quality medical education, access to leading medical research and rich campus life in nine Indiana cities. In June 2016, the school launched the Precision Health Initiative, the first of IU’s Grand Challenge research initiatives, with the goals of leveraging precision medicine to cure at least one cancer and one childhood disease, and to find ways to prevent one chronic illness and one neurodegenerative disease. The Regenstrief Institute is a pioneer in health informatics, having developed many of the technologies and approaches that are now common across electronic health records and health information exchanges. Innovations developed at Regenstrief have helped make Indiana one of the most health-wired states in the country. Regenstrief Institute’s informatics experts and software engineers are actively working to build the infrastructure that will support incorporating genomic data and standards into electronic health record systems and routine health care. LifeOmic is a rapidly growing technology company pioneering the use of DNA sequencing and big data analytics to advance the development of precision medicine. The LifeOmic Precision Medicine Platform™ is a secure cloud service for the long-term storage, retrieval, analysis and clinical use of genomic and other medical information. LifeOmic’s founder and CEO Don Brown, MD is one of Indiana’s most successful entrepreneurs. Dr. Brown founded two of the first three software companies ever to go public in Indiana – Software Artistry and Interactive Intelligence. Interactive Intelligence was acquired by Genesys Telecommunications Labs in 2016. At the time of the sale, Dr. Brown donated $30 million to the IU School of Medicine to found a new immunotherapy center to fight cancer and other diseases.